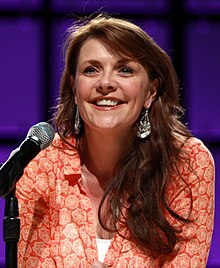 Amanda Tapping (born 28 August 1965) is an English-Canadian actress and director. She is best known for portraying Samantha Carter in the Canadian–American military science fiction television series Stargate SG-1 and Stargate Atlantis. She also starred as Helen Magnus in the science fiction-fantasy television series Sanctuary. Born in Rochford, Essex, England, Tapping moved with her family to Ontario, Canada, when she was three years old. She attended North Toronto Collegiate Institute, where she excelled in Environmental Science and Drama. However, when she finished in 1984, she decided to focus her attention on Drama, attending the University of Windsor School of Dramatic Arts in Windsor, Ontario. After graduation, Tapping continued to study Theatrical Arts while performing in several stage productions. She appeared in several television commercials and played a variety of roles in television and film productions, such as The Outer Limits and The X-Files. She also formed a comedy troupe, the "Random Acts", with collaborators Katherine Jackson and Anne Marie Kerr, in Toronto in the early 1990s. Tapping is best known for her portrayal of Samantha Carter in the science fiction television series Stargate SG-1, which debuted in 1997. After SG-1 aired its final episode, Tapping reprised the role of Samantha Carter on Stargate Atlantis as the new commander of the Atlantis expedition. In Season 5, however, Tapping's role on the show was reduced to that of "special guest-star" with only occasional appearances because she chose to focus her attention on the development of a new series for Syfy called Sanctuary. The show expanded on an original series of eight webisodes released on the internet in 2007. The bulk of the scenery and characters were entirely green screen and CGI creations. Tapping served as both star and Executive Producer of the show. Tapping was reportedly working with William Shatner on a 2011 animated webisode series "The Zenoids", written by Alan Dean Foster. Tapping and Shatner voice characters, and Tapping is Executive Producer. In 2007, she won a Canadian Comedy Award for Best Actress for her role in the short film Breakdown. On 18 September 2012, she was cast as an angel named Naomi on Season 8 of the TV series Supernatural. She was a recurring character who appeared in seven episodes. She reprised the role in season 13's "Funeralia", nearly five years after the character's apparent death. She was also named as ACTRA's 2015 Woman of the Year. ACTRA (Alliance of Canadian Cinema, Television and Radio Artists) is the national union of professional performers working in Canada. Tapping's first directing experience was during the seventh season of Stargate SG-1 on an episode titled "Resurrection", written by co-star Michael Shanks. She directed the seventh episode of Sanctuary season two titled "Veritas". She has directed three episodes (6, 8 and 10) of Primeval: New World, three episodes (2.12; 3.06; 3.07) of Continuum, and four episodes (5, 6, 9 and 10) of Olympus and more recently directed episodes of Dark Matter, Van Helsing, The Magicians, and Supernatural, as well as the historical drama X Company She also directed 5 episodes (1.12; 2.4; 2.7; 2.8 and 2.9) of Netflix Original Show Travelers ; Tapping directed the season finale of the 2017 series Anne with an "E". Tapping married Alan Kovacs in 1994. As of 2004, she lives with her husband in Vancouver, British Columbia. She has two living brothers, Richard and Christopher. A third brother, Steven, died in December 2006. Tapping has one daughter, Olivia, born on 22 March 2005. 1995 Forever Knight Dr. Naomi Ross "Near Death"
1996 Side Effects Dr. Barbara Bertrand "Easy Breathing"
1996 Goosebumps Mrs. Merton "It Came from Beneath the Sink"
1996 Due South Audrey McKenna "Starman"
1996 Kung Fu: The Legend Continues Annie "Shaolin Shot"
1996 The X-Files Carina Sayles "Avatar"
1996 The Newsroom Lindsay Ward "Dinner at Eight"
1998 The Outer Limits Cmdr. Kate Girard "The Joining"
1999 Millennium Dr. Cantor "Borrowed Time"
2009–2010 Stargate Universe Col. Samantha Carter "Air: Part 1", "Incursion: Part 1"
2010 Canadian Comedy Shorts Mary Johnson "Breakdown"
2013 Motive Dr. Kate Robbins "The One That Got Away"
2014 Package Deal Jillian "Danny's New Job", "Everybody Loves Beth"
2015 Killjoys Dr. Jaeger "Kiss Kiss, Bye Bye"
2004 Stargate SG-1 Season 7, Episode 19: "Resurrection"
2014 Strange Empire Season 1, Episode 3: "Other Powers"
2016 The Magicians Season 1, Episode 11: "Redemial Battle Magic"
2016 The Romeo Section Season 2, Episode 4: "Seeds of War"
2018 Siren Season 1, Episode 8: "Being Human"
The Lion in Winter as "Alais Capet"
Tapping has won 6 awards, out of 13 nominations. ^ Warriner, Tiffany. "Amanda Tapping BFA '88". University of Windsor. Retrieved 18 October 2012. ^ "Biography". The Official Amanda Tapping website. Archived from the original on 17 June 2009. Retrieved 14 September 2009. ^ Ryan, Maureen (20 February 2007). "Amanda Tapping joins 'Stargate Atlantis'". Chicago Tribune. The Watcher. Archived from the original on 17 September 2008. Retrieved 14 September 2008. ^ "Atlantis To Start Season 5". Sci Fi Wire. SCI FI. 6 February 2008. Archived from the original on 6 July 2008. Retrieved 14 September 2008. ^ "The Archives – 2007". The Comedy Network. CTVglobemedia. Archived from the original on 6 July 2011. Retrieved 14 September 2008. ^ "'Supernatural' spoilers: Amanda Tapping cast in major new angel role, Mike Farrell goes mental". Zap2It. Archived from the original on 21 October 2012. ^ "Official Stargate Website: Episode: Resurrection". MGM. Retrieved 19 September 2009. ^ Szymanski, Mike (11 September 2009). "How did Amanda Tapping produce, direct and act Sanctuary". Sci Fi Wire. Retrieved 19 September 2009. ^ AnneTheSeries [@AnneTheSeries] (30 April 2017). "#AnneTheSeries Season Finale Tonight at 8/8:30NT on @CBC (also, it's directed by @amandatapping!)" (Tweet). Retrieved 3 June 2017 – via Twitter. ^ Tapping, Amanda (26 December 2006). "From Amanda – Her brother Steven". The Official Amanda Tapping website. Archived from the original on 7 July 2011. Retrieved 16 October 2009.